California is an expansive, highly varied state with many vocational and trade schools to match. Secondary and post-secondary students alike can get the career and technical education needed to earn high-skill, high-wage jobs in California’s growing sectors, like business and healthcare, through the state’s community college system, technical schools and traditional high schools. This guide goes in-depth about California’s top industries and occupations and the vocational and trade schools that can prepare students to land those jobs. California students enrolled in trade and vocational schools throughout the state have a huge selection of career training options. Due to California's varied economy in areas that range from technology to farming, students enjoy a wide selection of programs to choose from in community colleges, career colleges and trade schools. 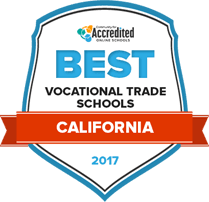 Find the best California trade and vocational schools with our rankings list, which includes criteria such as teacher to student ratio, tuition rate and more. Sacramento’s American River College (ARC) provides students with a full schedule of certificate programs in fall, spring and summer semesters. Their extensive career-focused certificate programs are designed for students in business, industrial, education, sales, technology, human services/emergency response, and allied health fields. ARC certificate programs include animation, accounting, new media and photography, automotive maintenance and repair, computer applications for business, information systems security, mobile programming, culinary arts, early childhood education, electronics technology, solar energy, environmental conservation, fashion, digital game design, horticulture, organizational management, music industry technology, practical nursing, public safety, theatre arts and welding. Sacramento City College is the seventh-oldest public community college in California and the largest In Sacramento’s Los Rios Junior College District. Sac City offers two kinds of career certificates: the Certificates of Achievement (12 academic units or more) and Certificates (under 12 units) that demonstrate occupational skills. The broad selection of programs leading to Certificates of Achievement include majors in accounting, aeronautics, allied health, business, office administration, computer information science, cosmetology, early childhood education, electronics technology, fashion, graphic communication, vocational nursing, and railroad operations. Sac City students are supported by academic counseling services and the college’s Learning Resources Center. Non-degree undergraduate programs at College of the Sequoias lead to Skill Certificates or a Certificates of Achievement. Online professional development courses are available in sustainable energy, skilled trades/industrial, IT and software development, allied health and fitness, media/design, business management, and the hospitality and service industry. The Hanford center of the College of the Sequoias hosts the fire and police academies serving Tulare and Kings Counties. The Tulare College Center in Hanford is home to the COS agriculture career and degree programs. Online career and educational programs counseling is available to students via email. At Cosumnes River College career education programs lead to Certificates of Achievement (18 units or more) and Certificates of Proficiency (less than 18 units). Proficiency certificate programs were designed in coordination with consultants in business and industry to prepare students for job roles that do not require an undergraduate degree. Certificates of Achievement programs are offered in accounting, agribusiness, automotive repair technology, computer information technology, culinary arts, retail management, medical assisting, photography, welding and veterinary technology. Certificates of Proficiency are offered in taxation, automotive tech, building inspection and construction technology, computer science, early childhood education, human services and real estate. Cerritos College’s Certificates of Completion programs provide rapid vocational training for students looking for a direct pathway into their chosen professions. Completion requirements vary based on minimum proficiency expected for the vocations. For example, 3-D Animation requires 6 credits, automotive collision repair (17.5 credits), cybersecurity (17), software development for C+ (9.5), paralegal (9), online journalism (15), industrial design (5.5), real estate (12), and machine tool technology (15.9). The college also offers non-credit certificates in many of the same vocations. Cerrito students are supported by the college’s Veterans’ Resource Center, Library Resources Center, and Career Development Center. California’s community colleges make up the biggest higher education system in the country and are California’s largest workforce training providers. However, while they provide both post-secondary and secondary education, community colleges are not the only vocational and trade schools in California. Post-secondary students can also get career and technical education (CTE) through California’s Regional Occupational Centers and Programs (ROCPs), apprenticeship programs and adult education programs. Comprehensive high schools, magnet school and programs that focus on specific vocations, early-college high schools and ROCPs provide vocational and trade education to California’s secondary students. Prospective students can discover specific vocational and trade schools in California that meet their educational and career goals through the search tool below. California’s community college system offers associate degrees and career training certificates in over 175 different fields. Almost as many postsecondary students were enrolled in CTE programs in 2013-2014 as secondary students: 942,427 postsecondary vs. 970,235 secondary. 82.28 percent of California’s postsecondary students earned their certificate, degree or credential in the 2013-2014 school year – that’s almost 30 percent higher than the national average. Slightly more men were enrolled in secondary CTE programs in 2013-2104, but slightly more women were enrolled in postsecondary CTE programs. While California has early college high school programs and vocational and trade magnet schools, Vocational and trade programs that fulfill high school graduation and University of California admissions requirements are available through traditional high schools, early-college high school programs, and vocational magnet schools. These programs allow secondary students many opportunities to earn one-year, less-than-one-year and even associate’s degrees in their desired vocations while still in high school. These credentials are also available to postsecondary students who enroll in one of California’s numerous community colleges, many of which are vocational-specific or have entire career and technical education centers within the school. Postsecondary students can earn industry credentials through adult vocational and trade programs and Regional Occupational Centers and Programs (ROCPs). The following chart provides the breakdown of credentials California’s vocational and trade students are earning. In California, the industries projected to add the most growth between 2012 and 2022 are business and professional services, education, and healthcare and social assistance. A growing population and changing demographics will continue to push demand of employees in education, healthcare and social assistance careers, so job opportunities in these sectors are expected to remain high. These industries are not only expected to provide the most job openings in California, they are also expected to see the most growth over time. As a result, many of the fastest growing occupations fall within these industries, but there are some outliers. For example, web development jobs are not only expecting a large number of job openings, they are also the fastest growing career in California for people with associate’s degrees, with a 31.6 percent increase between 2012 and 2022. Medical and clinical lab technicians come in second, and licensed vocational nurse occupations are the fastest growing for people with postsecondary non-degree credentials, followed closely by surgical technologists. The table below shows California jobs with the most annual job openings, divided by those requiring non-degree credentials and those requiring an associate’s degree. In Los Angeles County, nursing assistants, teaching assistants, licensed vocational nurses, medical assistants and heavy tractor-trailer truck drivers are the occupations requiring some college or a secondary non-degree with the most expected job openings between 2012 and 2022. Registered nurse careers have the most projected job openings for those holding associate degrees. Prospective students can get the vocational and technical training needed for these in-demand careers through Los Angeles’ technical high schools, CTE high school programs, adult training programs, community colleges or vocational and trade schools. CBD College, Los Angeles City College, Los Angeles County College of Nursing and Allied Health, Los Angeles ORT College, Los Angeles Southwest College, and Los Angeles Trade Technical College are a few non-profit secondary school options that provide vocational and trade students with the training they need for these in-demand careers. Similar to Los Angeles, registered nurses can expect the most job openings in San Diego between 2012 and 2022 for trade students who earn an associate degree. The occupations with the largest job prospects for those with non-degree credentials or some college are nursing assistants, computer user support specialists, teacher assistants, medical assistants and licensed vocational nurses. The Center for Employment Training-San Diego is a small career education training college than can help students get their vocational training credentials, but trade students can also earn their education from San Diego’s public community colleges: San Diego City College, San Diego Mesa College, and Skyline College. Secondary students can earn vocational and trade education through the public school system and CTE high school program offerings. The California Department of Education’s information source for adult learners. Provides information about various learning programs. A further explanation of California’s Regional Occupational Centers and Programs. Provides extensive information regarding the California school system, including research, statistics, education news and specialized education programs. Comprehensive search tool for Californians to find employment in the state. A statewide nonprofit that supports the California Community College system. Provides a variety of resources for students, ranging from workforce development to success guidance to car assistance. Provides information and resources to California job seekers, including material on employment and laws, job fairs and career training programs.